I left Paris in February intrigued by what made French macaroons so good. Their texture is the right balance of chewy, creamy, and crunchy, and the flavor can be anything – rose, chocolate, mocha, lemon, raspberry, or something more imaginative. This weekend, a trip to Dessert Studio – where there were no macaroons, but Earl Grey infused gelato with dark chocolate “chantilly” and a fair amount of conversation about desserts – inspired me to give it a try. Rumors on the web: it’s easy to do, but hard to do right. The first problem is almond flour. Debate rages about whether almond meal as sold in the US is the same as almond flour. Some recipes call for you to pulverize almonds yourself. I bought almond meal and fully intended to process it further in my spice grinder, but I couldn’t find the spice grinder (of course 30 minutes later, when it was too late, I realized it was just hidden behind something on a shelf). So I mixed it with confectioners sugar, as called for in the recipe, and decided to “push the outside of the envelope” as Tom Wolfe and a gaggle of flight test pilots might say. You know a recipe’s good if you can mess around at the edges and still get good results. 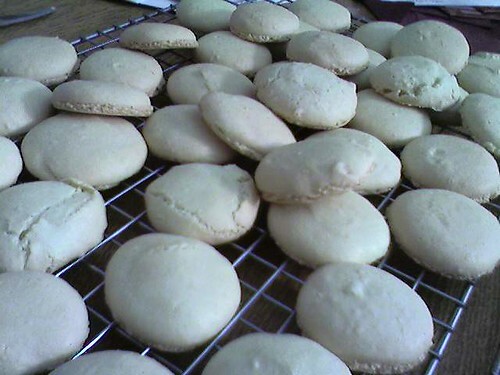 I used this recipe for the macaroons, but with orange extract rather than raspberry… I also added a drop of the flavoring to the macaroon batter itself, rather than saving all the flavoring for the ganache. 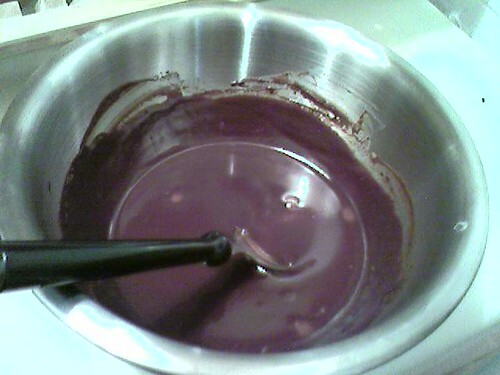 The batter is thick and a little grainy – I have a feeling that my almond meal test is going to crash and burn. Let’s just hope it still tastes good, even if it’s a mile off in texture. Then again, it’s not over yet. The recipe calls for a “makeshift pastry bag,” made of a plastic bag with a corner cut off. 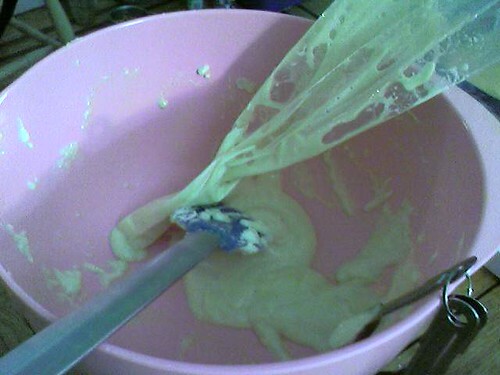 I figured I had real pastry bags and tossed my batter into one, but I didn’t use the right decorator tip and it came out in irritating little ribbons, so I took the tip off and just squeezed the batter out of the end of the pastry bag. That was a little too wide, so my macaroons look like lumps rather than “Hershey’s kisses” as intended… still crossing my fingers that they taste good! Looks can come later. Now they are sitting out on my kitchen table until the outside surfaces harden a bit. 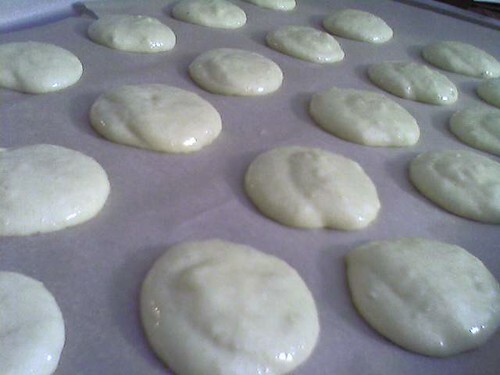 They’re out of the oven… Some look great, some are cracked or misshapen homemade. So much for the perfect smooth rounds from Paris. I tried the smallest one and it was pretty good – I didn’t nail the texture, but I’m hoping the others will be creamier because they are bigger and wouldn’t have dried out so much in the oven. I am letting them cool before filling them and doing the final taste test. They’re done. It was surprisingly quick to spread the ganache on one cookie, press another onto it, and voila! 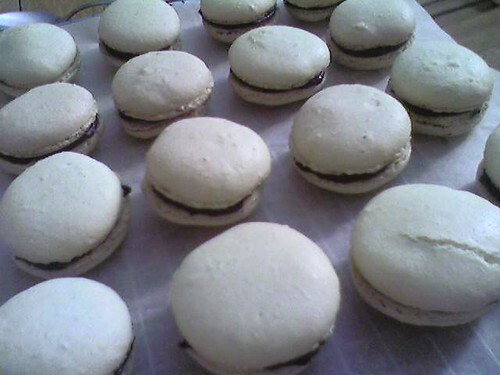 macaroons. The verdict: close in texture, though not perfect – I do think finer almond flour would help because it’s thick rather than delectably smooth – and not quite right in taste. I think I prefer the macaroons I had in Paris, which stuck to one flavor. The chocolate-orange combination is too heavy and overwhelming, in my opinion. I remember tasting each macaroon at Laduree and delighting in the individual flavor – lemon, mocha, vanilla, each one intense but still delicate. Next time I’m doing plain orange cream with orange, vanilla with vanilla, etc. Maybe even Earl Grey! This place– http://www.nutsonline.com/nuts/almonds/flour.html– actually calls it flour instead of meal, but every other place I’ve seen uses the terms interchangeably and says that almond flour/meal are both ground up blanched almonds. You could probably find a French import company to buy it from because I bet there is probably some kind of difference in flavor. Things from France just taste better, they do. LOL. OK, I don’t even like macaroons yet at 11:30PM I’m now going to Google where on earth I can find them at this time of night in Brooklyn…those look delicious! I was also bitten by the macaroon bug while in Paris this fall. My favorite: violet flavored macarron (crispy outside, chewy and moist inside) with sweetened (but not too sweet) whipped cream and huge juicy blackberries! Perhaps the best thing I have ever eaten. A very fine Almond Flour is made in the U.S. by Bob’s Red Mill of Milwaukee, Oregon. Their many varied products are found througout the west and can be ordered by calling or e-mailing http://www.bobsredmill.com.